Happy hump day, dear readers! For today's blog post, I wanted to share with you the products I have either emptied this year for the Project Pan Challenge or have decided to purge from my life. My goal is to either empty or purge 150 products this year, and with the progress I have made this far, I suspect I'll be able to meet this goal if not surpass it. Let's jump in! 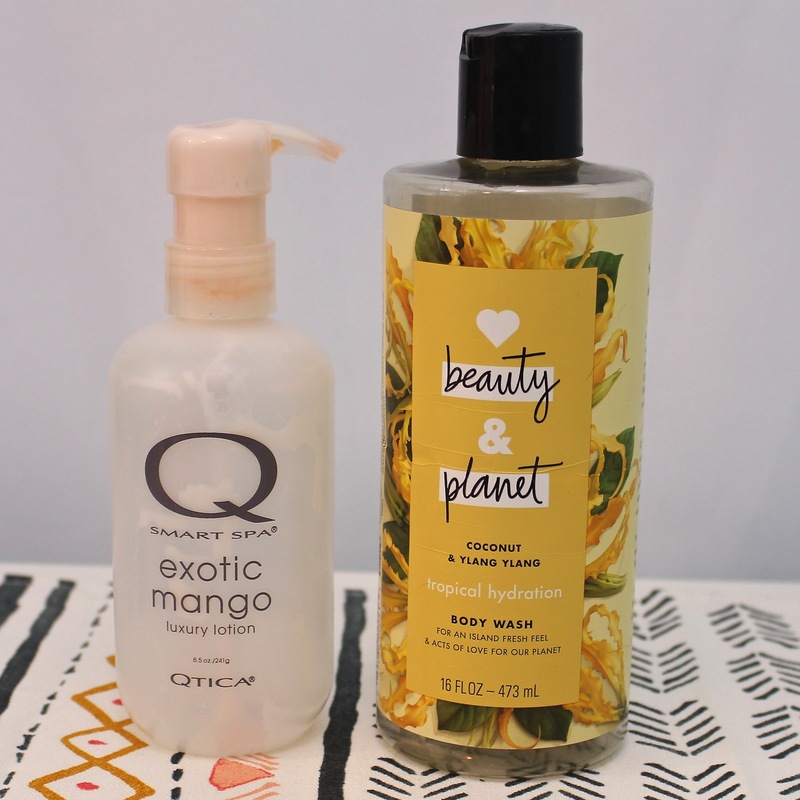 Exotic Mango Luxury Lotion | Qtica Smart Spa I have a small problem with collecting and opening many bottles of lotion, and it is pretty uncommon for me to finish them up. To help me with this challenge, I pulled out three bottles, from different brands and scents, and forced myself to stick with just those three. This is the first I have finished up. The consistency of this lotion is light and absorbs quickly into the skin. While I do like this line, I'm going to try to use up some of the other bottles I have on hand before I pick up more. The Exotic Mango scent was pretty nice although not my favorite. I'm likely to pick up a different fragrance in the future. Coconut & Ylang Ylang Tropical Hydration Body Wash | Love Beauty & Planet I picked this up at my first Target run when we moved back to Arizona the week of Christmas, and I am only now finishing it off! While I would have liked for the coconut to be a little more prominent, I really liked this product and have plans to pick it up again in the future. Again, I have several other bottles on hand and I would like to get through those first. Mandelic Acid Expert Age Spot Corrector | Able Skincare I picked this up on a whim when I saw it on Zulily and have been using it off and on ever since. I'm not sure that I noticed any major improvement in the coloration of the few spots on my face, but then I can only use this once a day (in the morning) and have to take breaks after about five days or so of use. 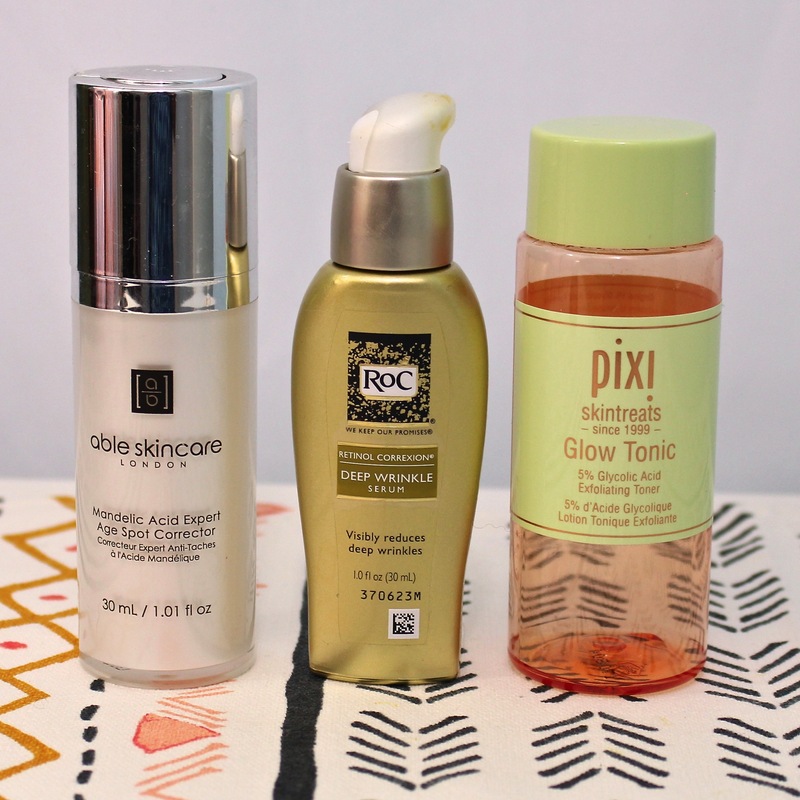 I'm not sure if my skin is too sensitive to use this daily or if it didn't like some of my other skincare products I used within my morning routine. I finished this bottle, but I'm not going to buy more in the future. Retinol Correxion Deep Wrinkle Serum | ROC While I do have pretty sensitive skin, particularly when it comes to my face, I found that I could use this ROC retinol easily enough. I incorporated this into my evening skincare routine and would use it daily with skipping generally a day in the week. I'm very in tune with how my skin feels, so once I would get the slightest burning sensation, I knew it would be best for me to skip the next night's application. While I do like the serum, I currently have the night cream that I want to use. I'll decide later which I prefer or if it will just depend on time as year as my skin's needs change. Glow Tonic Exfoliating Toner | PIXI Beauty An icon in the beauty industry, this is a product that needs no introduction. It was too harsh for me to use this on my skin alongside the Mandelic Acid Corrector (above), so I used this on my off days. My closest Target shockingly didn't have any in stock when I was there last week so I'll have to either check back again or make a run to another one. Prep + Prime Natural Radiance Base | MAC Cosmetics I've not really used skin primers since I started using my CōTZ Face tinted sunscreen, but I've been meaning to use up this since I had it. My makeup went on smoothly after application although the "natural radiance" aspect set my skin up to looking oily earlier than usual. I didn't hate it but I didn't love it and personally found this product to be rather forgettable. Vanilla Mint Lip Scrub | Skin Snob I love when products combine scents like this, so I was ridiculously excited with this lip scrub from the moment I laid eyes on it. It is a little different than others in that it is thick and meant to be rinsed off after scrubbing instead of licked off and consumed. While that wasn't a deal breaker for me, it does make the use a little messier than others. I ended up keeping my jar next to my shower so I could incorporate this into my face washing routine and get all the excess product off my skin without making a mess. I enjoyed this scrub as is although I'd be excited to try another flavor profile if Skin Snob ever decides to go another direction! Just Peachy Cuticle Balm | Noodles Nail Polish I found this tube in a secret pocket I forgot about in one of my handbags and can't recall when I picked this up. It still smelled nice and had a good texture so I opted to use it up rather than toss it. 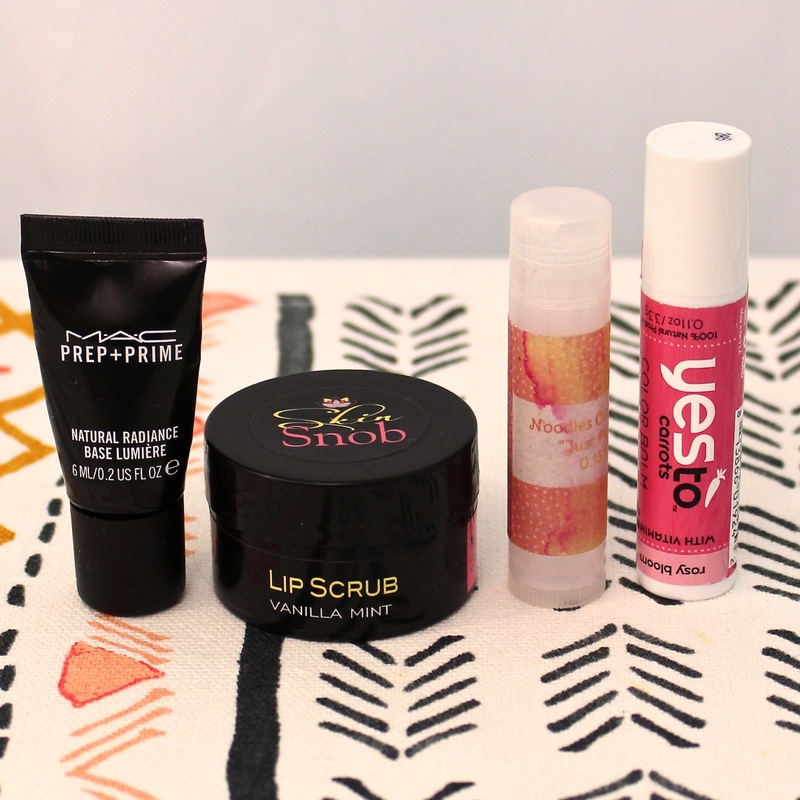 I like stick balm like this for quick and easy application. My cuticles appreciate the little pick me up and the rest of me is glad to not have to deal with any residue rubbing off on everything around me. Rosy Bloom Color Balm | Yes To Carrots This tinted balm used to live on my desk at the office of my workplace, but now that I work remote after the move, it has been in my purse and used for a quick touch of moisturizing colour on days I just didn't feel like wearing lipstick. I found the tint to be very subtle, but it did allow it to work with just about any eye look or clothing colours I may have been wearing at any point. In addition to emptying out products, I am purging my vanity of products that I don't want to use for whatever reason. I initially thought the purging aspect of my challenge would be difficult, but it's been easier than I thought and I appreciate not having the clutter around my house! March wasn't much of a purge month for me, but there were still two products I opted to let go. 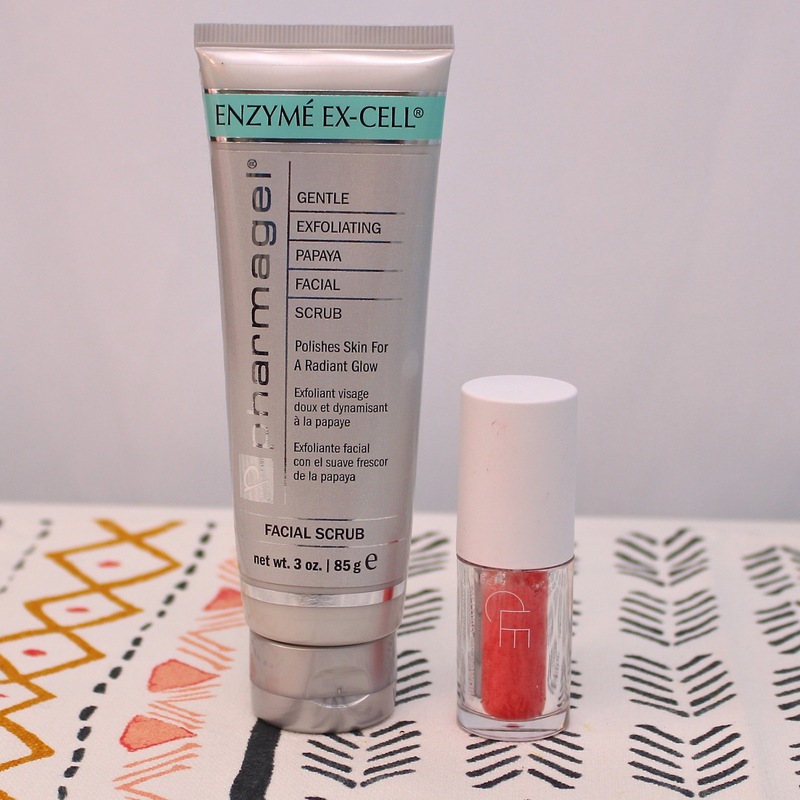 Enzymé Ex-Cell Gentle Exfoliating Papaya Facial Scrub | Pharmagel You can put "gentle" in caps all you want on the label, but once I see walnut shell listed in the ingredients, I will give you the side eye. Even though it is powdered in this case, I strongly feel that you cannot completely get rid of potentially sharper edges, and I do not want to be creating microtears on the skin. I have tested a few on my blog, but I cannot bring myself to do it right now. This is a hard pass for me. Ultra Summer Melting Lip Powder | CLE Cosmetics Call me old if you want, but I just don't get this melting lip powder. As the name implies, it is a powder that comes out on a doe foot applicator and melts with your body heat. According to the directions, you apply this powder directly to the lips. I found when I did that, the colour payout was wildly uneven. After blotting my lips together multiple times in an unsuccessful attempt to distribute the colour and melt the powder further, I found there was the slightest gritty sensation that just never went away. I really wanted to like this since it was so different, but I just cannot get behind how terrible the overall finish was, both in colour distribution and the texture. March has been the month with the fewest empties and purged product thus far, but with only three months into the year and just under halfway to my goal, I'm still doing really well this year! With recent Spring Break traveling and my leaving town again this week, I just haven't fully unpacked or organized my makeup. I have several things I am on the fence about purging, but I haven't made a final commitment on that yet. I have been diligently working my way through products and am so close to finishing up a few things now! Are you taking part in the Project Pan Challenge? How has your progress been so far this year? Is there anything you are having a difficult time letting go? I'd love to hear from you!